1. 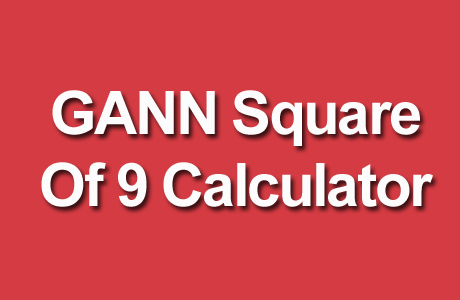 Our Calculator is based on the theory of W. D. GANN’s Square Of 9. Gann relied heavily on geometrical and numerical relationships and created several tools to help with his work. Among these tools is the Square of Nine, Square of 144, and the Hexagon. 2. The Square of Nine, or Square as we will refer to here, can be constructed in at least two ways. The static Square has the number 1 at the center and the dynamic Square has the historic low of the time series in the center. The Square is a grid of numbers that begins in the center with the number 1. The number 2 is entered in the box to the left of the number 1. Moving up and around clockwise (some are constructed by moving anticlockwise so as to work consistently with Astro charts), 1 is added to the previous number and the resulting number is entered in the box. This is repeated in a spiral around the center. 3. The important parts of the Square are the center, the Cardinal Cross composed of the vertical and horizontal rows that intersect at the middle of the square, and the lines extending at 45 degrees, 135 degrees, 225 degrees, and 315 degrees that constitute the Fixed Cross. The Cardinal Cross and Fixed Cross are used to determine likely points of support and resistance. 4. This calculator is meant only for intraday trading. 5. Enter the Late trade price of any stock/index/ underlying anytime during the market hours. 6. After entering the price, click the calculate button. 7. You will get the buy and sell recommendations. 1. You will be using our app/calculators knowing fully the risk of the stock market. 2. No legal or otherwise liability will be fixed on us under any circumstances. Calls generated by this app/calculators are purely based on artificial intelligence & not a professionally qualified and expertise view. 3. The calls generated by this app/calculators are based on formulas and these are not a recommendation to any person to buy or sell any securities. The information is derived from a source that is deemed to be reliable but its accuracy and completeness are not guaranteed. The author does not accept any liability for the use of this calculators.